Judging from the black plastic bezel on the Coles supertweeters, I'd say the BC1's are later examples. In seem to recall early ones having white cone surrounds. Judging from the black roll surrounds on the bass drivers and the black plastic bezel on the Coles supertweeters, I'd say the BC1's are late examples. Correct Geoff , the serial numbers are in the 24,000 and I believe 27,000 was the last run . I've been using Tannoys since my early twenties and I certainly wasn't old before my time! I remember riding my brand new Kawasaki S3a 400 and having a race with a nice shiny one of those up Tottenham Court Rd in the seventies, from one set of lights to the next. I blew the Jag off each time and eventually the guy wound the window down and said "what the heck are you riding?" He couldn't believe a dinky little bike leaving him standing! 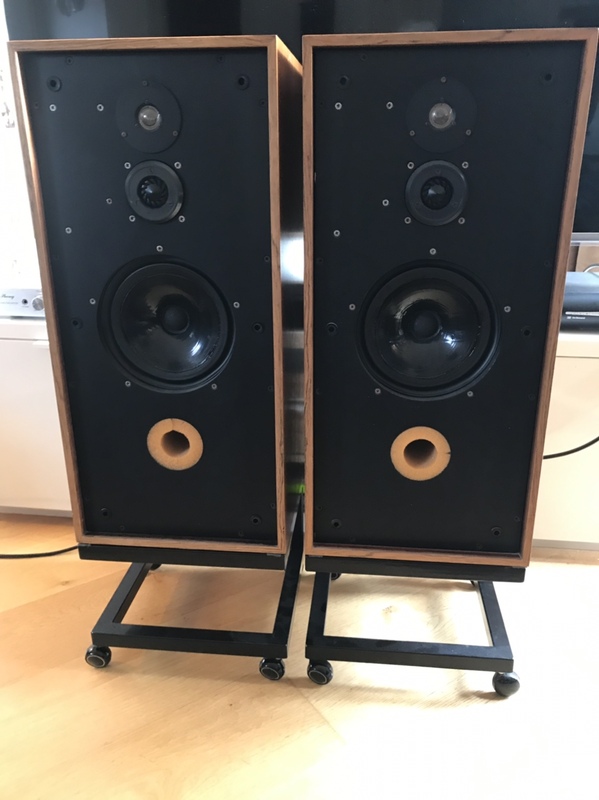 Is there a right or wrong way to have the stands ? Which way around?